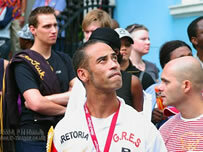 Henrique is the leading figure of Brazilian carnival in the UK and has taught most of the UK's samba dance teachers. He has been involved with samba since he was 8 years old - growing up in Rio de Janeiro in a family whose whole focus is Rio samba culture. Henrique was “adopted” by Tia Alice, a past director of Mangueira and Engenho da Rainha. Through her, he learnt the many dance styles of Maculelê, Maracatu, Samba-reggae, Mestre Sala, Samba No Pé and Afro-Brazilian. He also started to work making costumes for her and developed this skill to work for several other samba schools. Henrique came to London in 1990 and has choreographed and performed in many stage performances including the 1995 Pet Shop Boys World Tour, Marc Almond and S-Club 7, the European tour of Alcione and the headline grabbing show at the Royal Premier of Moulin Rouge. Following a period with Mahogany, he became the Carnavalesco (Carnival Artistic Director and Costume Designer) and Principal dance teacher of London School of Samba. He introduced to them the main elements of Rio samba schools and led their artistic development culminating in the achievement of 2nd place in the Notting Hill Carnival in 1999. He choreographed and directed the Millennium Dome samba show on New Years Eve before HM Queen Elizabeth for which he also designed the costumes. In December 2001 founded Paraiso School of Samba in order to focus on creating an authentic samba school uncompromisingly following the Rio de Janeiro model in both its organisation and philosophy of integration with disadvantaged communities. Henrique is still a Passista (principal dancer) in Mangueira, Rio’s most developed and most famous samba school and takes part each year in the world famous Rio de Janeiro Carnival.